If you need quick, targeted baseline knowledge about using technology for teaching and learning,Making Sense of Online Learning is for you. This practical, no–nonsense primer will help you understand how online learning technologies work and how they fit into your organization. You ll gain a working knowledge of important topics such as design, infrastructure, and evaluation and the confidence to make informed decisions that will help your learners and organization thrive. Since information about online learning changes at Internet speed, the book is supported with a dedicated Web site ([external URL] filled with up–to–the–minute suggestions for tools and resources. The online learning people promised a revolutionary breakthrough and went about replicating the textbook and the classroom. They hyped the bells and whistles and neglected basic instructional design. Clients bought rigid proprietary platforms that violated all principles of systematic change. This book responds to my concerns: The focus should be on learning and performance improvement and not on the technology. Just take a look at the table of contents. I would have outlined the book exactly the same way. But Patti and Amy write with greater wit and competency. Sivasailam Thiagi Thiagarajan, resident mad scientist, Workshops by Thiagi, Inc. 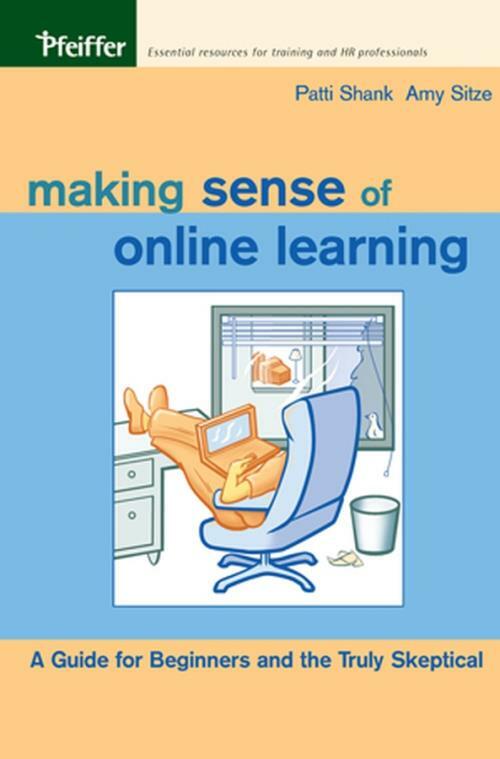 The information in this book will help you make informed decisions about using online learning in your organization. Shank and Sitze give thoughtful, ingenious insights about big topics like design and learner needs. They also know how to get down into the weeds to explain the great features of a tool. Where Has Online Learning Come from and Where Is It Going? When Does Using Technology for Learning Make Sense? How Can I Tell Whether My Organization Is Ready? What Is Good Online Learning? What Activities Should Be Included in Instruction? How Do I Select Interactions and Activities? 3. The Language of Online Learning: How to Spell HTML. How to Speak the Right Language. What Are the Most Common Terms That Are Misunderstood by Folks New to This Field, and What Do They Mean? 4. Designing for the Web. Does Traditional Instructional Design Work for Online Learning? How Do I Design with the User in Mind? How Do I Make Things Easy to Find on My Site? How Do I Make Sure the Site Is Easy to Navigate? 5. Tools and Technologies for Online Learning, Part 1: Development. How Do I Build Online Learning? What Are the Most Common Tools Used for Building Online Instructional Materials? What Do I Need to Know to Get Started? What Are Some Technologies I Need to Know About? 6. Tools and Technologies for Online Learning, Part 2: Infrastructure. What Tools Can I Use to Track Learners and Courses? What Tools Can I Use to Keep Track of Online Content? What Are Learning Objects, and How Do They Relate to Tracking and Managing Online Content? What Aspects of Online Instruction Should I Evaluate? What s the Difference Between Assessment and Evaluation? How Do You Evaluate a Course or Program? How Can You Evaluate Online Learning?